Economic Corridor, China's growing presence in the Indian Ocean as well as its growing closeness to Nepal as well as Bangladesh, its resentment over the visit of the Tibetan leader Dalai Lama into India, particularly Arunachal Pradesh, along with its proposed agenda of construction of a dam across Brahmaputra and a constant competetive effort from the part of both the nations to undertake developmental activities in Afghanistan, Sri Lanka et al. has created a vent in the Sino-Indian bonhomie relationship. This continues to have its bearing on regional as well as bilateral ties between both the nations, with respect to economic as well as trade relationships. However the initiative from the part of China to reignite the warmth in neighbourhood relationships via the initiation of official level talks is quite a welcoming attitude with regard to regional diplomatic perseverence. 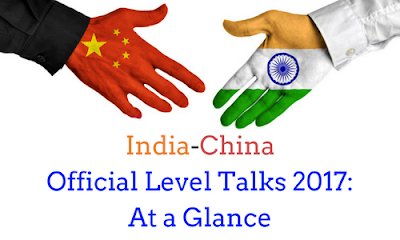 The official level talks hosted by Beijing was chaired by Indian Foreign Secretary S Jaishankar and Chinese foreign minister Wang Yi. The purpose as well as timing of the 'Restructured Strateguc Dialogue' was appreciated by both the officials as both cited the importance of improving their bilateral ties which perseverancemmands much of the global attention as both nations are the fastest growing economies of the world. Appreciating the efforts of India in undertaking and implementing various developmental projects in Afghanistan, China as well as India are gearing up for exploring further potential with regard to Investment activities in the terror hit nation. China also signalled and proposed a joint development project that would ensure co-operation as well as strategic involvement of India in rebuilding and investing in Afghanistan. Readiness with regard to resumption of purposeful strategic dialogue between the two nations on the backdrop of the changing power balances and notions elsewhere around the world, in an effort to strengthen the bilateral ties and to seek consensus on possible common grounds. Though Chinese officials had recognized the significance of associating with India on bilateral levels, which owes much to the common bones of contention like Afghanistan, Islamic State threats as well as the instabilities associated with the upsurge of Trumpian Diplomacy, much needs to be done with regard to plastering the ties firmly. India needs to bring China to its fold parricularly with regard to securing NSG membership as well as to brand Mazood Azhar as global terrorist at the United Nations. India should also watch out for China's attempt to establish a rapport with its neighbours who has joyfully signed up for the "One Belt, One Road" initiative, which might pose a concern with regard to its territorial integrity. The need of the hour is, rising above the stark differences, acknowledging the strengths as well as significances of each other, to take charge of the world economic and political order which as of now is in utter chaos; thanks to the political power as well as ideological shifts around the world.